My husband took a touching, candid family portrait this summer. There we were, the five of us, gathered around a large table, eating breakfast. Some of the plates were piled with pancakes, bowls were filled with fruit and cereal. The morning was sun dappled as the photo showed us happily engaged in a family discussion. A real Polaroid moment. 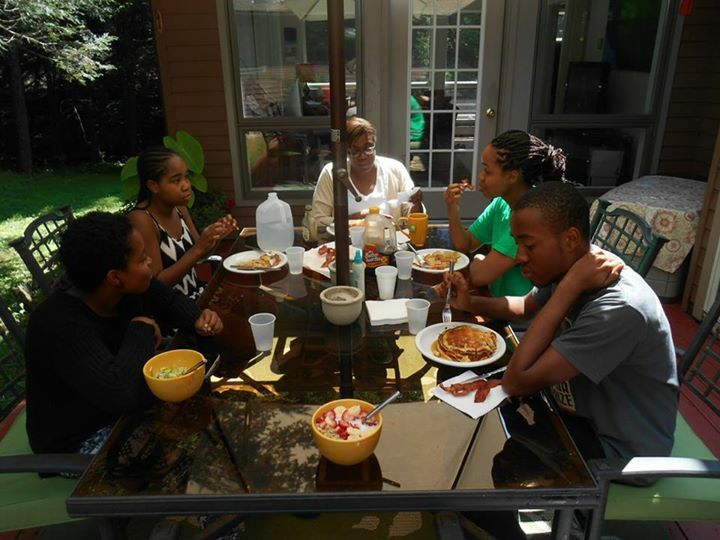 My husband posted the photo on Facebook and friends commented on and off social media, “Loved that family photo!”, “I wish I had breakfasts like that with my family!”, and “This picture reminds me of a story that needs to be written and illustrated.” In writing, and in life (and in photos from life), there is often a story behind the story. When I begin the research for each project, I start with certain impressions and ideas about my subjects based on job titles and excerpts of their lives. My hope is to flesh out these figures through biographies, historical reference, documentaries, films and through visiting historic sites. More often than not, I end in a very different place than I began. The stories behind the stories are the ones I find most interesting. The often not so pretty lives of the figures and characters in books. But it is these imperfections that make people accessible. Research often yields the not so pretty truths–depression, infidelity, bad tempers, dishonesty, hurdles and hardships. In other words–the truth. Back to the family photo. It was my daughter’s birthday. She requested buttermilk pancakes for breakfast. I don’t normally stock buttermilk in the fridge (and told her so in a not so friendly voice), but I did manage to find a bag of buttermilk pancake mix in the pantry. Another daughter insisted we eat outdoors. The rest of us complained. The pancakes were thin and inedible so they just ate the bacon, grumbling all the while. My son made his own batch but refused to make enough to share. More grumbling. Two poured cereal and sliced fruit. I made eggs. When we sat outdoors, we apparently interrupted a mega moth convention and they swarmed us. My daughters ran screaming inside to escape. I yelled, “And you wanted to eat outside? Just ignore them!” and returned to reading an article. Sarcastic comments were exchanged. When the girls were reseated, my husband decided now was as good a time as any to grab his camera for a nice, family photo. In defiance, we all refused to pose. No matter how picture perfect the photo, the image, the accomplishments, there is always the truth, the reality, the story behind the story. This entry was posted in Uncategorized and tagged breakfast, Family, history, lesa cline-ransome, photos, research, stories. Bookmark the permalink. I love this!!! Wonderful post and (still) beautiful family!!! Your description of the “ideal” family breakfast gathering sounds quite typical of any big family gathering. I would dare to add, any laughter usually would be the result of some crass, bathroom humor joke. Breakfast is scary ,low blood sugar, morning grumpiness, no coffee etc…it’s a real risk you took. Amazing that the photo has a Norman Rockwell feel to it, with Erma Bombeck text.